Sony has been able to stay in the top of the android smart phone market by their flagship model Sony Xperia Z. But, the house of Sony Corporation has gone a step ahead in experimentation, by launching the next flagship model from their house this Monday. According to the reports from the house of Sony it seems that this new Sony Xperia ZR will be capable of clicking images underwater. 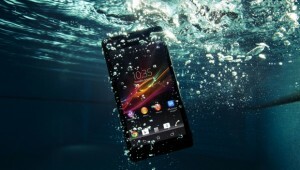 In the previous month , it was heard for the first time that there was new model coming from the House of Sony, but yesterday it was officially launched and proven that the mobile can be drowned in water for a stretch of thirty minutes and is also able for imagery clicks in underwater. On the eve of the official launch of this flagship model, The Sony team has even uploaded a video to get a more candid view of the specs of this model. The Sony Xperia ZR is suspected by many people as a slightly suppressed version of their very successful flagship model Xpera Z. This is because; the Xpera ZR has a display screen quite smaller than that of Xpera Z and the resolution capacity is also not as powerful as its predator, Xpera Z. If we glare through the design of the latest Xperia ZR which is officially launched in May 13, then we can easily say, it has no real difference than the previous flagship model from the house of Sony. Rather the Xperia Z has a display screen of only 4.6 inch and a resolution of 720 pixels which is way weaker than the Xpera Z. The house of Sony maintains their signature Bravia technology and uses 1 GB RAM and Chipset of S4 Qualcomm Snapdragon. The camera specs of the latest release Xperia ZR requires special highlight. It can be rightly said this is one of the areas where the Xperia ZR has worked really hard. If Xperia Z has gone a step ahead as compare to other mobile companies in being certified as the water and dust resistant , then the Xperia ZR has created an advanced leap in the water resistant part. The Xperia ZR is certified with IP55/IP58. Here, the rear camera has 13 mega pixels capability; it has sensors of Exmor RS. This, particular quality of camera strength has allowed the Xperia ZR to shoot HD quality videos underwater. The video which was uploaded by the Sony in the YouTube actually interprets such a dimension of the camera of Xperia ZR. The Sony Xperia ZR has an operating system of Android 4.1.2. There no such mention that whether this particular model can be upgraded automatically to the next version of Android or not. There is no such mention about the price of the latest launched Xperia ZR. If you are on the lookout for its price range then watch this space for more updates.